Objective The Non Interventional Evaluation with Golumimab (GO-NICE) study aimed to document patient and treatment characteristics as well as clinical effectiveness and safety in adult patients newly treated with the tumour necrosis factor inhibitor golimumab (GLM). Design Prospective non-interventional study with 24-month observation per patient. Setting 158 office-based and clinical-based physicians in Germany. Intervention GLM administered in the 50 mg dose subcutaneously in monthly intervals under real-life conditions. Results Of the 1613 included patients, 1458 patients were eligible for final analysis: 474 patients with rheumatoid arthritis (RA, 54.9±13.4 years, 72.8% women, 64.7% biologic-naïve), 501 with psoriatic arthritis (PsA, 50.5±12.1 years, 54.1% women, 56.5% biologic-naïve) and 483 with ankylosing spondylitis (AS, 43.6±12.3 years, 66.5% men, 61.0% biologic-naïve). 664 patients completed follow-up (2-year retention rate 45.5%). Disease Activity Score 28-joint count erythrocyte sedimentation rate (DAS28-ESR) decreased from 5.0 to 2.9 after 24 months (p<0.0001) in patients with RA, and Bath Ankylosing Spondylitis Disease Index score decreased from 5.1 to 2.4 (p<0.0001) in patients with AS. Response rate calculated in patients with PsA by modified Psoriatic Arthritis Response Criteria was 67.9% after 24 months. Most adverse events were of mild or moderate nature, and no new safety signals were detected. According to the physicians’ clinical assessments, treatment with GLM was successful (no adverse drug reaction and a clear or moderate therapeutic effect in an individual patient) in 55.0%–56.6% of patients with RA, PsA and AS, respectively, at month 3, increasing from 74.5% to 76.1% at month 24. Conclusions GLM subcutaneously once monthly led to substantial improvements in clinical effectiveness in patients with various inflammatory rheumatic diseases who could be followed up in a real-life setting in Germany. The treatment was well tolerated, and the safety profile of GLM was consistent with that observed in the previous randomised controlled trials. The strengths of our study include the prospective data collection and the large cohort of consecutive patients in a high number of centres throughout Germany, making it representative for the German rheumatologists’ setting. The study is first to report real-world data on all three main inflammatory rheumatic diseases for which golimumab (GLM) is approved. It provides evidence that prospectively enrolled and patients who are unselected in terms of disease characteristics, comorbidities and concomitant medications benefit from treatment with GLM. The limitations of this real-world study include the lack of randomisation, the lack of blinding and the lack of a control group. The non-interventional design may introduce selection, allocation or channelling bias and confound the association between treatment and outcomes. Further, there was a relatively high rate of patients lost to follow-up with no information on outcomes, who were not accounted for in a statistical manner. The studied population was a mix of biologic-naïve patients and patients with previous use of biologics. The efficacy and safety of GLM has been shown in these indications in a number of large-scale randomised controlled studies,4–6 and their open-label 5-year extensions.7–10 These studies have entered selected patients in terms of disease characteristics, comorbidities and concomitant medications according to study inclusion criteria, and have been performed nearly a decade ago. We therefore aimed to document current utilisation of GLM and patient characteristics in the indications RA, PsA and AS, and to capture the effect of treatment according to the indication label on disease activity, in a real-life setting in Germany. GO-NICE was an open-label, multicentre, prospective observational study, which took place in all regions in Germany. The study was performed in accordance with the Declaration of Helsinki and standards of Good Clinical Practice. All patients provided written informed consent prior to participation. Patients were eligible for this non-interventional study, according to the Summary of Product Characteristics (SPC), if the following criteria were met: definitive diagnosis of RA, PsA or AS, age ≥18 years and absence of any contraindication for GLM. Patient consent for participation and pseudonymised analysis of personal health data, no prior treatment with GLM and indication for use of GLM applied subcutaneously (SC) with an auto-injector according to the label. While no explicit exclusion criteria were formulated to avoid patient selection bias, GLM was to be prescribed in line with the specifications of the drug labelling including the contraindications for use. Patients were evaluated prior to the first administration of GLM according to standard of care and if possible every 3 months thereafter for 2 years (in total up to nine visits). The dosage was 50 mg SC as per product labelling. The study was performed between 1 April 2010 and 11 September 2015. The Physician’s Global Assessment (PGA) of patient’s health status was assessed in all three groups by the physician on a visual analogue scale (VAS) ranging from ‘0’ (free of complaints) to ‘10’ (strong discomfort). Adverse events (AEs) were described by type, severity, time pattern and outcomes. Investigators or their staff entered data from the patient charts via a secure internet connection into a standardised data entry form. In a subset of centres (selected randomly or by predefined criteria, respectively), study data were compared with the patient files (source data verification). Analyses were performed in an exploratory manner using descriptive statistical methods. For continuous variables, the number of patients with non-missing data, mean, SD, minimum, 25% quartile, median, 75% quartile and maximum were calculated. For ordinal and categorical variables, frequencies were calculated based on all observations with non-missing data for this variable. Incomplete datasets were included in the analysis. Missing GLM treatment start date was replaced by date of visit 1. There was no imputation of missing values for any endpoint. No sensitivity analyses were performed. The safety population consisted of all patients with at least one administration of GLM. All AEs occurring during this observational study were coded using Medical Dictionary for Regulatory Activities (MedDRA), V.13.1. The incidence of AEs and adverse drug reactions (ADRs) by MedDRA System Organ Class were calculated (number, frequency) for the total safety population and by indication. All effectiveness analyses were conducted for the evaluable patients (who had the baseline (BL) assessment and at least one additional visit) and the completer patients (who had the BL assessment and the visit at month 24), grouped by indication. Clinical results were analysed by visit. Changes from BL were analysed by repeated measurement analysis for time trends. Established outcome measures were selected which also comprised patient-related outcomes. Patients were not involved in the design of the study, however, directly contributed data on PRO (reported in a separate paper). Study reports will be disseminated to investigators and patients through this open-access publication. At the 158 sites, 92.4% of the physicians were rheumatologists, 4.9% dermatologists and 2.8% others specialists. Patient disposition is shown in figure 1. A total of 1613 patients were enrolled (100%, safety population) at 158 sites in Germany. One hundred two patients had major deviations from the observational plan or retrospective documentation, 6 patients withdrew consent and 47 patients had a BL assessment but no follow-up. 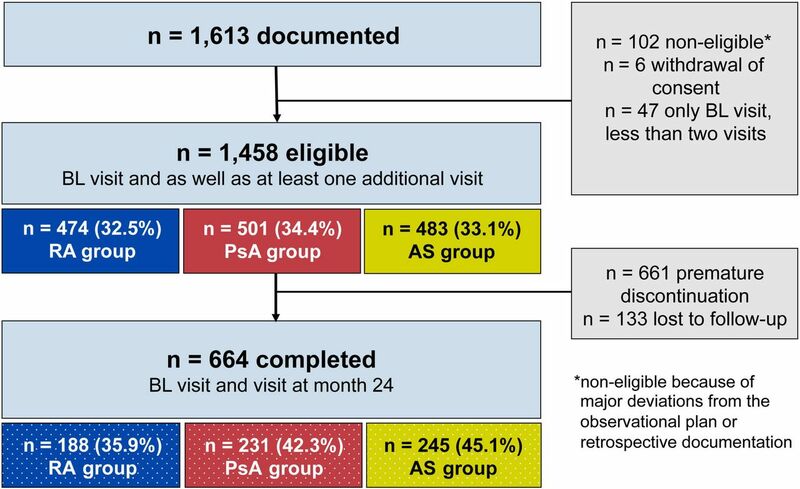 Thus, 1458 patients had a BL assessment as well as at least one additional visit and were eligible for final analysis (evaluable population): 474 (32.5%) with RA, 501 (34.4%) with PsA and 483 (33.1%) with AS. Disposition of patients. A retention rate of 45.5% over 24 months was observed. AS, ankylosing spondylitis; BL, baseline; PsA, psoriatic arthritis; RA, rheumatoid arthritis. During follow-up, 661 patients discontinued the treatment prematurely and/or switched to other biological DMARDs or conventional synthetic DMARDs. The most common reasons for discontinuation (multiple could apply for a patient) were lack of effectiveness (n=292/661, 46.2% of RA, 41.6% of PsA and 39.3% of AS patients), AEs (n=142/661, 15.9% of RA, 24.7% of PsA and 25.1% of patients with AS), change of physician or relocation (n=38), symptom-free status (n=12), and family planning or pregnancy (n=8). The remaining patients did not provide reasons. 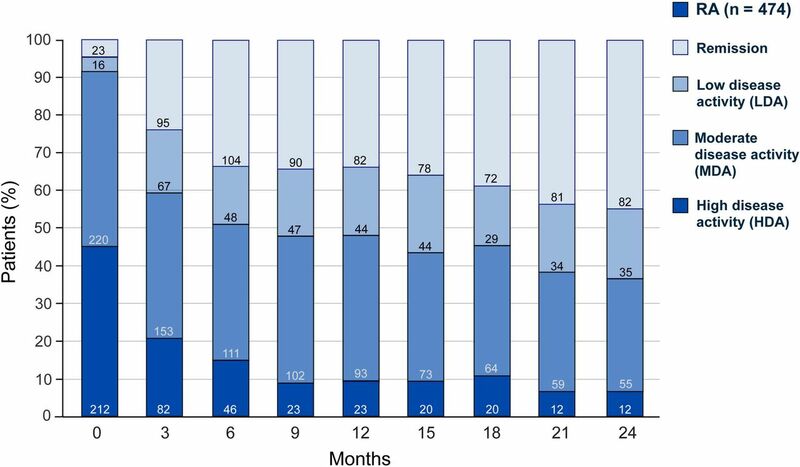 A total of 664 patients completed the 24-month observational period (BL until visit at month 24): 188 patients with RA, 231 patients with PsA and 245 patients with AS. Mean age lowest in patients with AS (43.6±12.3 years) compared with those with PsA (50.3±12.1 years) and RA (54.9±13.4 years) (table 1). The proportion of women was lower in AS (33.5%) than in PsA (54.1%) and RA (72.8%). Mean body mass index in the three groups ranged from 26.5 (RA) to 28.1 kg/m2 (PsA). In line with the age pattern, full-time employment was highest in patients with AS (62.1%) compared with those with PsA (45.1%) and RA (32.6%). At least one concomitant diseases at BL/visit 1 were documented in 264 (55.7%), 258 (51.5%) or 203 (42.0%) patients with RA, PsA or AS, respectively. The three most frequent concomitant diseases in patients with RA were cardiovascular diseases (n=119; 25.1%), diabetes mellitus (n=38; 8.0%) and pulmonary diseases (n=31; 6.5%), in patients with PsA cardiovascular diseases (n=151; 30.1%), depressive disorder (n=60; 12.0%) and diabetes mellitus (n=52; 10.4%), and in patients with AS cardiovascular disease (n=80; 16.1%), depressive disorder (n=24; 5.0%) and diabetes mellitus (n=23; 4.8%). In patients with RA, the mean disease duration since initial diagnosis was 10.4 years (range: 0.3–59.3 years). At BL, 64.7% were biologic-naïve. The mean number of tender joints was 8.4±7.1, and the mean number of swollen joints 5.9±5.3. Extra-articular manifestations were noted in 63 patients (15.7%). The rheumatoid factor was positive (RF+) in 344 patients (72.9%), and 346 patients had anti-CCP antibodies (74.2%). The majority of patients (n=432; 91.1%) had a moderate or high disease activity. The mean DAS28 at BL was 5.0, dropped significantly to 3.7 at month 3 and to 2.9 at month 24 (p<0.0001) (figure 2). After 3 months of therapy, 33.7% of patients were in remission (defined as DAS28 <2.6) and 44.6% after 24 months (figure 3). Disease activity (DAS28) over time in patients with RA. BL, baseline; DAS28, Disease Activity Score, 28 joints; RA, rheumatoid arthritis. Percentages of patients with RA with high, moderate, low disease activity, or remission over time. HDA: DAS28>5.1, MDA: 3.2<DAS28≤5.1, LDA: 2.6≤DAS28≤3.2, remission: DAS28 <2.6. DAS28, Disease Activity Score, 28 joints; HDA, high disease activity; LDA, low disease activity; MDA, moderate disease activity; RA, rheumatoid arthritis. Mean PGA on the 10-point VAS improved from 5.7 at BL to 3.4 at month 3 and to 2.2 at month 24. The mean time since initial diagnosis of PsA was 13.0 years (range: 0.0–49.2 years). At BL, 56.5% of patients were biologic-naïve. The average number of tender joints was 7.7±8.2 and swollen joints 4.1±5.0. Extra-articular manifestations were seen in 358 patients (87.7%): 197 patients had nail involvement (39.3%), 106 dactylitis (21.2%) and 70 enthesitis (14.0%) at BL. 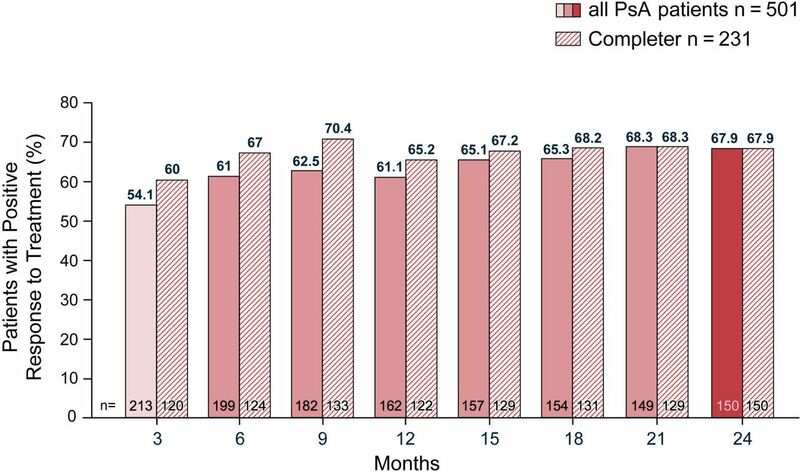 After 3 months, 54.1% of evaluable patients with PSA showed a good treatment response by modified PsARC, with a further increase to 67.9% after 24 months (figure 4). Proportion of patients PsA with a positive response (PsARC). PsA, psoriatic arthritis; PsARC,Psoriatic Arthritis Response Criteria. Mean PGA on the 10-point VAS improved from 5.5 at BL to 3.2 at month 3 and to 2.1 at month 24. The average duration since the initial diagnosis of AS was 9.6 years (range: 0.0–49.2 years). At BL, 61.0% of patients were biologic-naïve. Extra-articular manifestations were recorded in 34.4% of patients (n=144). The most common extra-articular manifestations were iritis (15.1%), enthesitis (12.4%), inflammatory bowel disease (5.8%) and dactylitis (3.5%). Three hundred eighty-seven (80.1%) patients with AS were Human leukocyte antigen-B27 positive. The mean BASDAI score (0–10) decreased significantly within the first 3 months from 5.1 to 3.0 points (p<0.0001). It continued to decrease up to 2.4 points during the following 21-month treatment period (figure 5). BASDAI over time in patients with AS. AS, ankylosing spondylitis; BASDAI, Bath Ankylosing Spondylitis Disease Index; BL, baseline. Mean PGA on the 10-point VAS improved from 5.7 at BL to 2.9 at month 3 and to 2.1 at month 24. According to the physicians’ clinical assessments, treatment with GLM was successful (no ADR and a clear or moderate therapeutic effect in an individual patient) in 55.0%–56.6% of patients with RA, PsA and AS, respectively at month 3, increasing from 74.5% to 76.1% at month 24. In total, 910 (56.4%) out of 1613 patients who received at least one dose of GLM reported at least one AE. The AE rate was highest in patients with RA (61.1%, of 524 patients, reporting 762 events), followed by patients with PsA (309 patients, 56.6% of 546, reporting 733 events) and patients with AS (281 patients, 51.7% of 543, reporting 630 events) table 2.
AEs of severe intensity were reported by 79 of 1613 patients (4.9%) patients, by 28 (5.3%) patients with RA, by 28 (5.1%) patients with PsA and by 23 (4.2%) patients with AS, respectively. Serious AEs were reported by 204 patients (12.6%), by 75 (14.3%) patients with RA, by 70 (12.8%) patients with PsA and by 59 (10.9%) patients with AS. Four patients died (0.2% of 1613). One death case was considered, by the reporting physicians, unlikely related to GLM (one patient with RA had recurrent stroke). Three cases were not assessable (two patients with PsA and one patient with AS). One patient with PsA committed suicide and for two patients with AS, no information about the cause of death could be obtained. In the evaluated population, the Mendel-Mantoux test was done for 397 (27.2%) and the interferon gamma test for 1097 (75.2%) out of 1458 patients. Tuberculosis infection or a positive tuberculosis (TBC) test was reported as AE for four patients, possibly related for two patients (pulmonary tuberculosis and mycobacterial infection) and unlikely related according to the treating physicians for the other two patients (tuberculosis and mycobacterium tuberculosis complex test positive). Four cases of benign, malignant or unspecified neoplasms, all possibly related to the drug, were reported (fibromatosis, non-Hodgkin’s lymphoma and two prostate cancer). One case of demyelination, also possibly related, was reported. Overall in the GO-NICE study, patients in the three indications had a similar distribution of age and gender. Among patients with PsA, in GO-NICE, 61% showed a positive treatment response on PsARC at 6 months with a further increase to 76.9% at 24 months. In GO-REVEAL, at 24 weeks, 70% of patients had a positive treatment response17 (PsARC results at 2 years were not reported). Similar results were seen in the completer patients as in the evaluable patients in all three groups. In our study, treatment with GLM 50 mg SC once monthly was well tolerated. Most AEs were of mild or moderate nature, and no new safety signals were detected. On descriptive analysis, AEs and serious AEs were more frequent in patients with RA in line with the higher mean age in this group. The safety profile of GLM was consistent with that observed in the previous randomised controlled trials. The long-term results of the five above described phase III studies in RA, PsA and AS have been reported recently in pooled reports after 3 years23 and after 5 years,7 respectively. In the report on 3-year exposure on GLM (ie, 1 year longer than GO-NICE) in a total of 1249 patients on GLM 50 mg, AE incidences per 100 patient years (95% CIs) were: for death 0.3 (0.01 to 1.6), for serious infection 5.3 (3.2 to 8.3), for tuberculosis 0.0 (0.0 to 0.8), for opportunistic infection 0.0 (0.0 to 0.8), for demyelination 0.2 (0.1 to 0.5) and for lymphoma 0.0 (0.0 to 0.8). AE rates were similar when taking the 5-year data into account.7 The authors concluded that SC GLM safety through 5 years remained consistent with that of other TNF antagonists.7 23 In our study, similar event rates of the described events were noted (including rare cases of infection, cancer and demyelination). Our study has several strengths and limitations. Strengths include the relatively large cohort of prospectively enrolled and consecutive patients with one of the three index diagnoses which were mainly treated by rheumatologists. Our cohort of patients with inflammatory rheumatic disease receiving TNF-α therapy is one of the largest of its kind to date. The initial responses to GLM treatment as well as overall outcomes match the effects seen in the phase III pivotal trials what externally validates the results. The strongest limitation in this analysis is that high drop-out rates were not accounted for in a statistical manner and which is considerably higher compared with the controlled studies on the drug. Neither imputation techniques, weighting nor likelihood methods were applied to address selection bias induced during follow-up. Further, the lack of a control group of patients who did not receive GLM therapy and the relatively high rate of patients lost to follow-up must be considered (with no information on the outcomes on these patients). However, for DAS28, PsARC and BASDAI, similar results were seen in the completer patients as in the evaluable patients. ACR20/50/70 response criteria were not used in line with clinical practice in Germany. Furthermore, the GO-NICE populations were a mix of biologic-naïve patients and patients with previous use of biologics. Subanalyses with biologic-naïve patients and patients with prior treatment with biologics will be provided at a later stage. The fact that all patients came from Germany with a homogeneous study population make interpretation of findings easier for use in the German healthcare system and local regulators and payers, but may limit the generalisability of the findings to patients in other healthcare settings and countries. Clinical decisions of the treating physicians may assign selected patients to GLM as compared with other treatment options, what potentially may introduce allocation or channelling bias and confound the association between treatment and outcomes.24 Physicians and patients willing to participate in non-interventional studies such as ours may be particularly motivated or interested in science and therefore also be subject to selection bias. Finally, the follow-up period of 2 years is relatively short when considering that PA, PsA and AS are chronic conditions requiring life-long treatment. GLM 50 mg SC once monthly was an effective treatment in patients with RA, PsA and AS in a real-life setting in Germany. The suboptimal retention rate in this study, while being comparable to other recent observational studies, is a notable limitation. During the 24-month observation, in patients available for follow-up, good treatment response and effectiveness were observed in the three indications RA, PsA and AS. Substantial improvement in disease activity (DAS28 and BASDAI), response (PsARC) and PGA was seen early at 3 months and was maintained throughout the 24-month observation period in line with the previous clinical studies. Treatment with GLM 50 mg SC was well tolerated, as most AEs were of mild or moderate nature and no new safety signals were detected. European Agency for the Evaluation of Medicinal Products (EMA). Simponi (Golimumab) Summary of Product Characteristics (SmPC). Latest renewal of authorisation. http://www.ema.europa.eu (accessed on 28 Feb 2018).
. A new approach to defining functional ability in ankylosing spondylitis: the development of the Bath Ankylosing Spondylitis Functional Index. J Rheumatol 1994;21:2281–5.
. 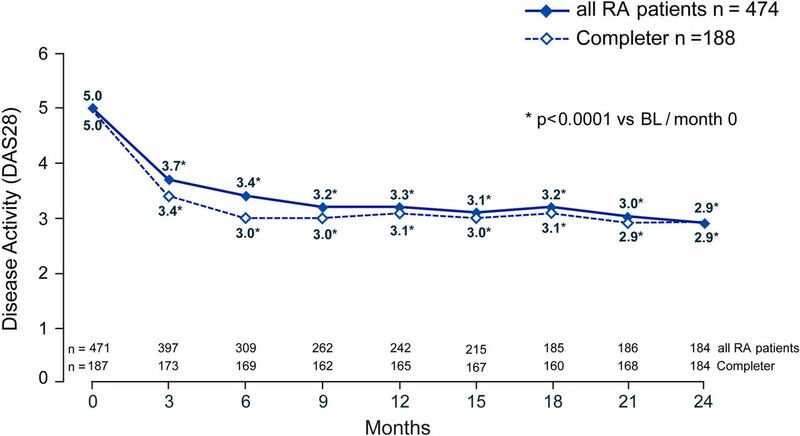 Two-year retention rate of golimumab in rheumatoid arthritis, psoriatic arthritis and ankylosing spondylitis: data from the LORHEN registry. Clin Exp Rheumatol 2017;35:804–9. Contributors All authors contributed to the design of the study and interpretation of the results. KK and MHT: wrote the first version of the manuscript. GRB, SW and MB-B: provided input into the concept and the interpretation of results. All authors reviewed and approved the final version. Funding This study was sponsored by MSD Sharp & Dohme GmbH, Haar, Germany. Competing interests KK has received funds for consultancy or research from: AbbVie, BMS, Celgene, Janssen Biologics, MSD, Pfizer, Roche and Sanofi-Aventis. GRB has received funds for consultancy or research from AbbVie, Bristol-Myers Squibb, MSD, Pfizer, Roche and UCB. SW has received funds for consultancy or research from AbbVie, Chugai, Janssen Biologics, MSD, Novartis, Pfizer and Roche. MB-B has received funds for consultancy or research from: AbbVie, Hexal, MSD, Roche and UCB. MHT is full-time employee of MSD Sharp & Dohme GmbH. Ethics approval Ethics Committee of the Ludwig-Maximilian University in Munich. Data sharing statement The datasets generated and/or analysed during the current study are not publicly available as they concern a proprietary product and sharing is not explicitly covered by patient consent.